Heat 1 tbsp oil in a pan. Add pinch of asafoetida and minced garlic. saute for few seconds. Add chopped spinach and salt to taste. Cook for 2-3 minutes. Add red chili powder, turmeric powder, coriander powder, cumin powder and mix well. Switch off the heat and let the mixture cool down. Take wheat flour in a mixing bowl. Add carom seeds, cooked spinach, yogurt and grated carrots. Start kneading the dough by adding little water at a time. Consistency of dough should be soft like a regular chapati dough. Cover the dough with the cotton towel and let it rest for half hour. Make a medium sized ball and roll it little thick than chapati. Roast nicely from both the sides by applying ghee/oil. Serve hot with pickle or raita. 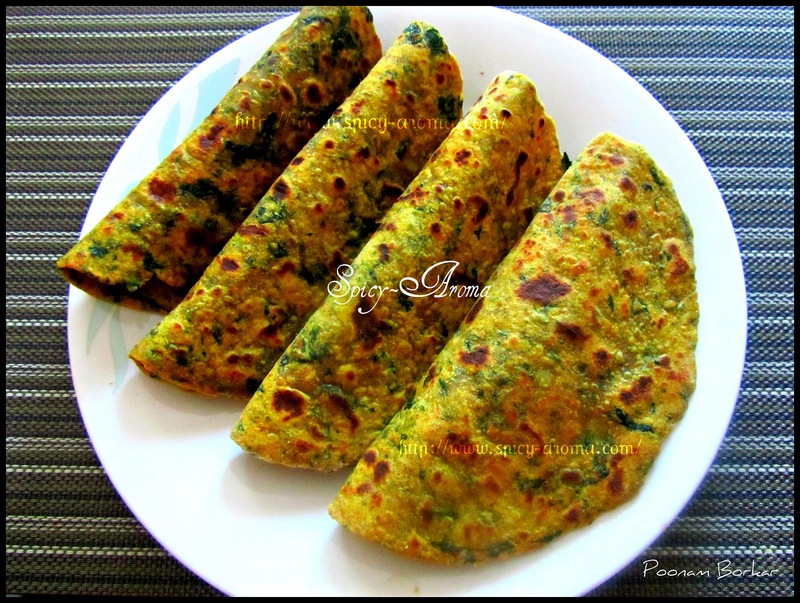 Very healthy colorful paratha..Looks so delicious..
looks real delicious. such a healthy bread too. As always, your parathas are the best.. Such a healthy paratha. Looks wonderful. very healthy n delicious parathas,looks colorful n inviting! if interested link it to HITS.Thanks! Thanks for visiting my blog Poonam. I never knew spinach and carrot make such an appealing combination...Will try this over the weekend! healthy parathas...surely kids will like it! Very healthy and nice combo paratha. Wow this looks amazing. I like the colours of this dish too!